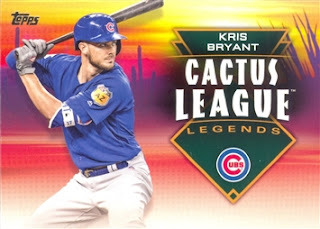 Series One has two spring training themed sets, one for the Cactus League and one for the Grapefruit League. Both are retail only, so these I would have had to get elsewhere even if Brent didn't have his problems with Topps. The Cubs have been a part of the Cactus League since 1952 (with the exception of a one-year stint in Long Beach, California). From 1952 to 1965 they trained in Mesa. 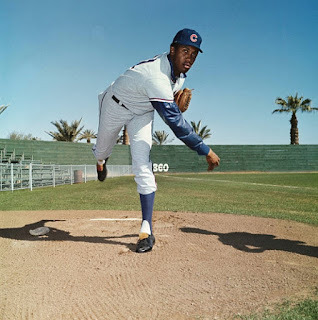 After that year in California, they returned to Arizona, taking up in Scottsdale, a run from 1967 - 1978. In 1979 they went back to Mesa and have been there ever since. Only the Giants have spent more time in Arizona than the Cubs. The Cactus League Legends set has 30 cards. Three of them are Cubs. 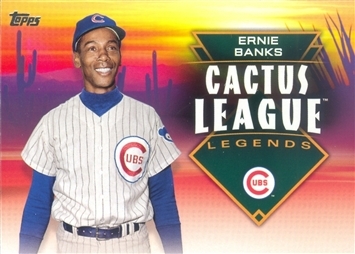 Ernie was given the first card in the set. 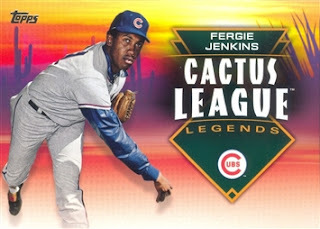 Notice that Topps used an era-appropriate Cubs logo. This year will be Bryant's sixth spring training in Arizona, but he's already a legend. OK, sure. This looks like it could actually be a picture from spring training, since Fergie is wearing a rubber jacket under his jersey. Gotta work up a sweat and lose those pounds gained during the off-season. It's cool that they actually used a Spring Training photo of Jenkins on this insert... but this is one of those insert sets that I question whether or not needed to be created. I agree. The idea is alright but they should use the cards to tell a story. If they shared a story about how they were spring training legends I would be happy to collect them. I think I would have been happier if they they used some lesser used players. Say for instance, Gary Scott... didn't he tear it up in Spring Training before? Yeah, totally agree there. Just guessing, though, it would be hard to generate much interest in a set that has Gary Scott, Ketel Marte, Chris Shelton and Angel Berroa as marketed talent. I like that Fergie Jenkins picture. It's not one I've seen before on cardboard. FanPost Friday: What is the best case scenario for the 2019 Cubs?